Who did you vote man of the match? Alex McLeish there trying his best to find something to be upbeat about. But the Scotland head coach has much thinking to do ahead of Monday's Nations League opener at home to Albania. Scotland have suffered their worst home defeat in 45 years and it only makes it slightly less painful that it came at the hands of the second best team in the world. They have to dust themselves down and shrug off any feelings of despondency. Monday was always the more important game and it has taken on greater significance after Albania beat Israel to give Monday's visitors a head start in what is a short sprint in their three-team group. Join us on Monday to see if McLeish's side can bounce back and claim only their second win in six games under his tenure. Scotland head coach Alex McLeish: "Mistakes cost us. We were doing okay in the first half and we made a mistake and lost the goal. "It was just a catalogue of errors. If anybody’s got to take the blame, it’s me for telling them they have to pass it. "It’s harsh lessons, big lessons for the young ones especially, but they should not be downhearted as they were up against a top team. “It looked the best choice of opposition for me. We’ve got to test ourselves." The Scotland head coach says tonight's defeat and performance gives him food for thought ahead of Monday's game against Albania. He says it is too early to say whether striker Leigh Griffiths, who came off at home time, would be fit for the Nations League game at Hampden. Captain Andy Robertson was the top Scot in our player rater, as voted by you lot out there. However, he was rated behind four Belgian players, with Eden Hazard topping the poll. Belgium coach Roberto Martinez, who spent some time in Scotland as a player with Motherwell, had some words of consolation for Scotland. "It was a nice environment," he said. "The players were well focused overall and for us it was a good excercise for Tuesday. "Take the scoreline away, we were very clinical in front of goal. "Alex McLeish has a new project and you have to be patient. "You can see they are a dynamic, energetic young group with strong technical ability. "There are positive signs. It was very difficult for us in the first half to break the system down and they counter-attacked with quality." Scotland head coach Alex McLeish on Sky Sports: "We shot ourselves in the foot. They’re a top, top team. "We were perpetrators of our own downfall. These are errors that should be easily eradicated. “It was a very difficult encounter against a great team. Quote Message: The Albania game is absolutely massive. They can't afford to lose them. Actually, if they don't win that one, can you imagine the blow to morale? The Albania game is absolutely massive. They can't afford to lose them. Actually, if they don't win that one, can you imagine the blow to morale? That's Scotland's fourth defeat in five games under Alex McLeish - and fifth defeat in six since Gordon Strachan stood down after the failed campaign to qualify for this year's World Cup finals. We are still waiting to hear the head coach's reaction to tonight's defeat. Taulant Xhaka's second-half goal proved to be enough for Albania to go to the top of Scotland's Nations League group after a narrow win over visitors Israel. In a three-team section, that makes it even more vital that Alex McLeish's side win on Monday. Richard: I didn't expect a dazzling display from the Scots, but it is clear we are going backwards. Give your verdict on tonight's performances. A harsh lesson in how simple mistakes can be ruthlessly punished. Scotland showed flashes in the first half and near the end, but they were outclassed in the main by a Belgian side who always looked like they had an extra man on the pitch. Albania are no Belgium, but Alex McLeish’s side will need to improve on this to guarantee the win when it starts for real on a Monday night. Alex: Total and utter garbage. Give Eck his SFA retirement Payday now before the damage gets worse. We have Tierney; Robertson; McGregor; Forrest; McTominay and other young boys that are better than this, Absolute disgrace. 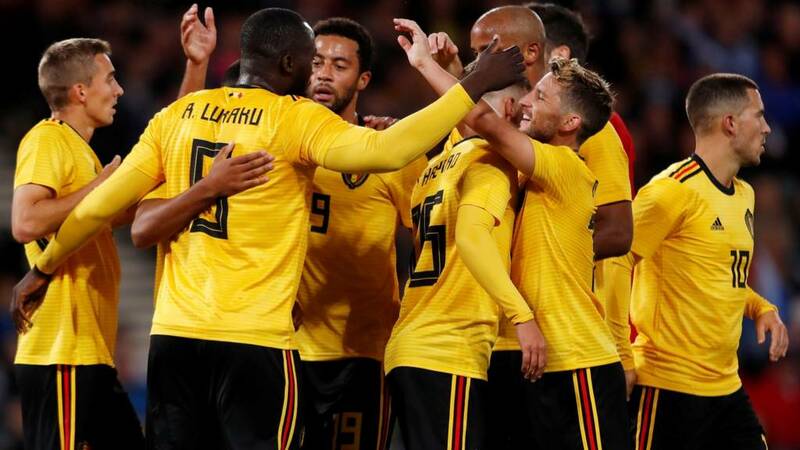 Romelu Lukaku's first-half strike had Belgium ahead at half-time, but the woodwork had saved the Scots three times already. The roof fell in after the break as Eden Hazard and Michy Batshuayi had them further ahead within seven minutes of the second half and the latter added another by the hour mark. Alex McLeish's side will be happy that Belgium looked like they took the foot off the gas thereafter. Scotland suffer their worst home defeat since a 5-0 thrashing by England in 1973. A harsh lesson for Alex McLeish and his side handed out by the second best team in the world.